Andrea had the dawn watch and had a 40 minute dolphin show in which they reportedly did tricks for her and asked her to go and swim with them. She was wearing her lifejacket and man overboard alarm tag so I think we would have found her had she jumped. Bertie thinks the dolphins must have eaten a big tuna off his fishing line. Unfortunately whatever ate it took the lure as well, so no chance of fresh tuna until we can buy more fishing gear. 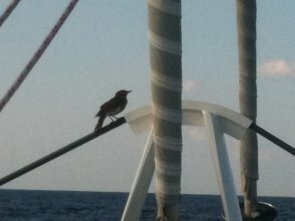 The picture is not a dolphin, it is a bird that visited us for an hour to have a rest. I tried giving it some chocolate cake but it was not interested. It has at least 50 miles to go in any direction before it finds land, so we hope it makes it. We have 250 miles to go to Gibraltar.